The kids and I became fans of Heirloom Audio Productions Audio Theater when we were asked to review In Freedom's Cause - The Real Story of Wallace and Bruce. When we were asked to review With Lee In Virginia I jumped at the chance. With Lee in Virginia is an audio CD adaptation of the G.A. 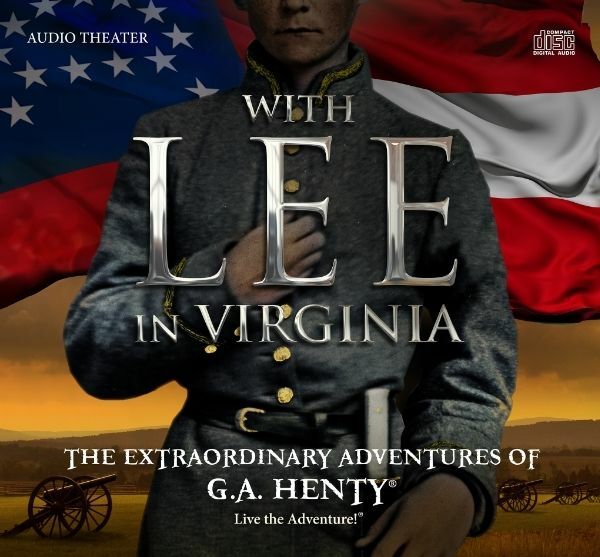 Henty book With Lee in Virginia - A Story of the American Civil War. The 2-disc Audio Theater CD's tell the story of a young soldier fighting in the Civil War - but with a twist. The main character, Vincent, is a southerner and a slave owner fighting with the Confederate army. Given the recent attention, especially via social media, to the Confederate flag and it's significance this CD production couldn't have come at a better time. The book, and CD's, combines true history with a little fiction to create the story; while Robert E. Lee and General Stonewall Jackson were real men and real history is referenced, Vincent and his slave, Dan, were fictional and are representations of the young soldiers and slaves of that time period. G.A. Henty did extensive research before writing his books to present a historical representation, as did Heirloom Productions - traveling to the battlefields portrayed in With Lee in Virginia. The CD has a definitely Christian slant, with plenty of prayer and Bible references, which we felt was very fitting for the time period. There are some household names in the cast of With Lee in Virginia; Kirk Cameron, Brian Blessed, Kelsey Lansdowne, and Sean Astin. The CD's tell the story of Vincent from his mid-teens, when the Civil War began, through his very early 20's when the war ended. It also tells the stories of his friends and fellow Confederate soldiers, some as young as fourteen, and the stories of slaves on his, and a neighboring, plantation. Vincent was a Virginian and we learn that he, and Lee, fought in the war not to defend slavery but to defend states rights and their home state. In fact, throughout the adventure Vincent questions whether slavery is right and whether it's what God wants, but he never questions his loyalty to his state and never considers leaving the Confederate army, feeling it's his duty to fight, until the war ends. Throughout the story Vincent, Lee, and Jackson maintain their faith in God and in doing what they believe is best for the nation. I really, really wish I could tell you the whole story but you have to get the CD's and listen to it! The kids - Ian (17), Mia (16), Adam (14), Kaden (12), and River (6) and I listened to the CD's in the car. At first I wasn't sure if they were paying attention because they were so quiet, but when I stopped the car they begged me to keep the car running so they could find out what happened next! That happened throughout both CD's and involved all the kids. Given that the CD's totaled 2 1/2 hours of play I thought it would be good to listen to them again, in case we missed or forgot anything the first time. Well, they definitely devoured With Lee in Virginia the first time, because the second time through they were saying the upcoming lines out loud and foretelling the story. They then spent some time telling their grandparents about the story. Every single one of them, and I, were enthralled by the story and fully engaged. 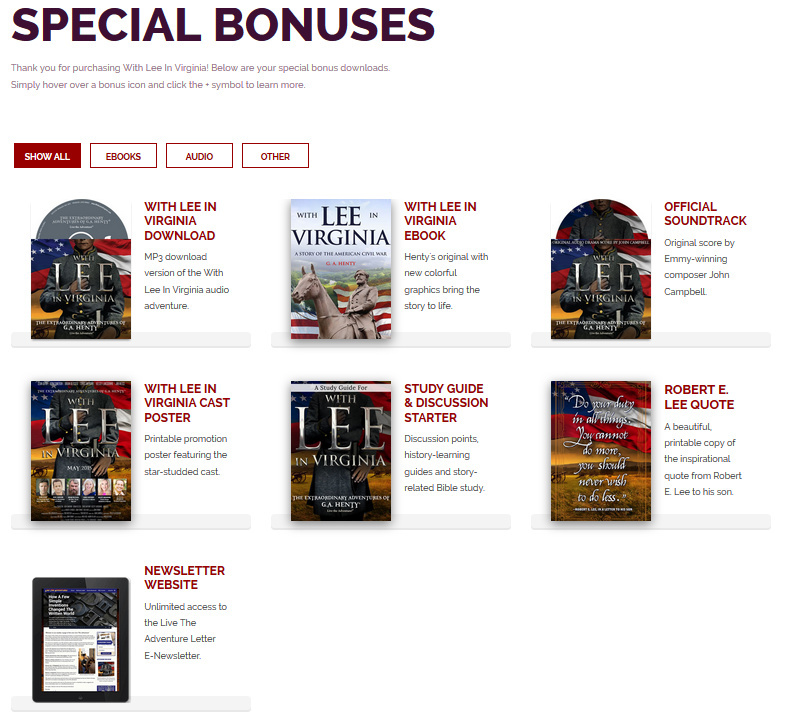 In addition to the CD's an assortment of downloadable bonuses are included with purchase, everything from a copy of the With Lee in Virginia book (300+ pages) to a complete study guide and story curriculum to a cast poster. While we opted to not use the study guide at this time I did take a look through it and was very impressed by how thorough it was. The kids and I strongly recommend this audio drama. It's such a different, and important, viewpoint of the war, and is a necessary reminder that the war wasn't solely about slavery - it was about states rights. The CD's bring the Civil War to life in a way that no textbook could, making a memorable impression on the listener. With Lee In Virginia is recommended for kids and adults, ages 6 and up and is available through Heirloom Audio Productions. Click the image below to read what other TOS reviewers had to say about this exciting audio adventure.